In the coming year we have decided to concentrate on problem solving in maths for the whole school. The following two documents outline our rationale behind doing so and how we will do it. We have no doubt that with the extra focus on problem solving the children will make great progress and meet the targets set down in the School Improvement Plan. Please come in and see me or Christine if you have any questions. 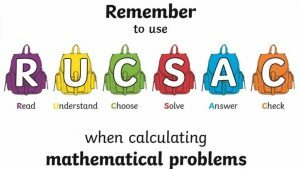 The whole school problem solving strategy being used is RUCSAC.